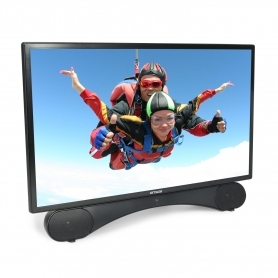 Enjoy all-in-one entertainment with this 24" LED television, including a built-in DVD player and Freeview HD. Experience stunning visuals with Full HD resolution and brilliant sound from the integrated soundbar. Discover the crisp image quality that the integrated Freeview HD tuner provides. A Full HD 1080 pixel screen provides a crystal clear picture so you can watch your favourite shows and films in impeccable detail. Not only this, but the X24DVDMK2 has an integrated soundbar for incredible sound. It’s housed in the TV stand for a seamless look and produces top quality audio that fills the whole room. 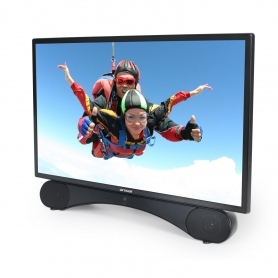 Despite its size, this TV’s sound is anything but small, with amazing Dolby Digital+ quality. 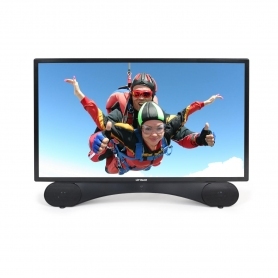 This TV is an ideal choice for any room, with a compact size and super slim built-in DVD player located on the side. Simply choose what you want to watch and easily insert a disc without the need to connect an external device. Freeview HD gives you free access to some of the UK’s much-loved channels, all in high definition. These include BBC One HD, ITV HD, Channel 4 HD and much, much more. You also have the option to watch up to 70 standard definition channels and listen to over 30 radio stations. With Live Pausing via USB, you can pause your programme using a dedicated button on the remote control. Whether you’re answering a phone call or checking on your food, it’s a handy option for busy households. You can view, fast forward or rewind live TV using a USB stick (not included), while twin tuners let you record a channel while watching another. With a whole host of connections available, there are plenty of additional entertainment opportunities to discover. Choose from three HDMI and two USB ports to connect various devices, from media players to games consoles. The X24DVDMK2 also allows you to connect your device wirelessly to the speakers via Bluetooth. Stream your top tracks directly on the TV from your phone or tablet and let this Linsar television become your complete home entertainment hub. 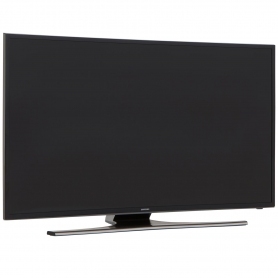 Available in a sophisticated matt black finish, this slim television is a stylish choice for any home. With the option to mount it on a wall or position it using the integrated speakers, it’s ideal for any room. What’s more, an energy efficiency rating of A means it has reduced energy consumption, saving you money on your electricity bills. This feature-packed compact TV by Linsar makes the perfect home entertainment hub. Add one to your basket today.